the tough spin cashmere. 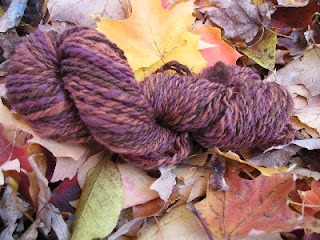 This is Chasing Rainbows merino/cashmere - can't find the tag right now so I'm not sure on the colorway. Bought from my favorite fiber crack dealer Morgaine at SOAR. This afternoon I'm going to a meeting where a social worker will tell my mother she can't live alone anymore. She has to go to an assisted or group home situation. She will have to give up her dog and basically hope that she'll be getting better. Once she's moved it will be a huge relief for me. She can't keep a home help worker - I've been shopping,managing her meds and money, doing her laundry, driving her every where & listening to her litany of woes. Mostly directed negatively at me. The cashmere was a wonderful balm last night. It's a little thick/thinner than I really wanted. But I predrafted it the last night of SOAR after a *few* beers. So it has fantastic memories spun in. It will be knit into some sort of neck snuggly for me. Stay tuned! Cashmere. (insert moaning, lusting noises here) I could spin cashmere. I must buy me some cashmere fiber. Sounds like you really deserve and need cashmere right now. Here's hoping everything goes as well as can be with your mom. Oh, you're back. How I missed you! The cash/merino looks fab. That's what I bought too, right? Today is my first day spinning since SOAR! Yay! 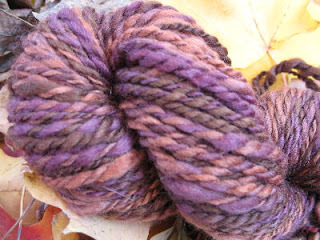 And yes, I'm still spinning up that sock yarn. Ah, Jillian, hope the meeting went as well as it could. You're not alone in the mom situation. I shake my head at the unending stream of negativity I hear from my mother. Sometimes I think all we can do is resolve to stay positive in our own old age. argh...big hug. It seems appropriate that you're spinning chasing rainbows fiber. And it WILL be schnuggly! I've been missing you, too! I feel the need for a roadtrip to your neck of the woods, but honestly, if I travel one more day before winter TNNA, I will fall over. You should come down for Bazaar Bizarre if you can, it's going to rock! it is awful but ultimately you will collapse if you keep on going as you've done. it's pretty amazing and a testament to your character that you have tried so hard to help someone who is making it so difficult, and that you have succeeded for so long. at least you will have the satisfaction of knowing that she did not prevent you from developing into a beautiful, kind, loving human being. The yarn is beautiful, I hope your situation improves. I dreamt about your cashmere last night. I was spinning it and you were standing behind me saying, "let go with your front hand and just pull your other arm back ... LET GO!" I woke up smiling.